When you want to get ahead in the workplace it’s really important that you to take every opportunity to demonstrate your skills. However, some situations are slightly more difficult to tackle than others. For instance, when dealing with people face to face, some professional people are absolutely unflappable, but when they find themselves on a conference call, they really struggle. So what can you do to make sure that even on a conference call you are getting your message across? The following tips ought to help you to deal with the unusual dynamic involved when a selection of people are sharing the same phone call. The most important thing is to prepare properly for the call if possible. You’ll know the topic before the call takes place so read up on it and consider some of the questions you may be asked about the subject. Also consider questions you’d like answers to regarding the topic under discussion. When the call takes place, it is important that you introduce yourself. You may be prompted by whoever is assuming the role of the host. However, it’s important to introduce yourself when you speak or make a point just to keep things as clear as possible. It’s not very impressive or useful for you to stay silent during a conference call, even if you are just taking everything in. Every now and again you have to make people aware that what they are saying is going in and that you are following the discussion properly. You want to demonstrate that you’re an expert in your field so take the opportunity. It’s difficult to gauge when exactly you should step in with a point during a conference call because there’s no body language to interpret. However, the best advice is not to interrupt someone in mid-flow and to interject in a manner that can be considered assertive and forthright but not rude. You absolutely mustn’t take over the discussion. This is not a platform for you to show off – it’s an opportunity for some productive conferring to take place. Allow people their time on the floor and if possible bring others into the discussion, especially when you know their input will be of value. Above all, be observant. Don’t let your mind wander. Do whatever it takes to stay focussed on the discussion and don’t carry on with other tasks during the call. It’s unprofessional to have to ask people to repeat themselves all the time and it makes it abundantly clear that you’re not paying due attention. 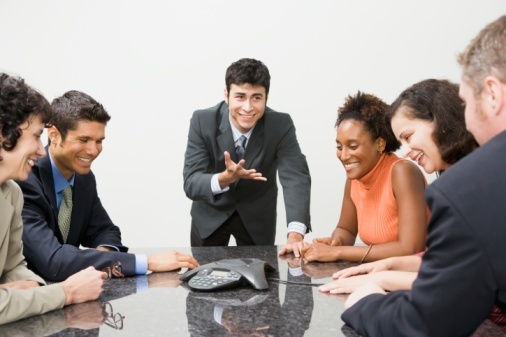 This article was written by telephone conferencing expert Matthew Portnoy.